Teachers, are you frustrated with the time and energy spent addressing persistent behavior issues? Administrators, are you aggravated with the time and energy spent on repeated referrals? How can anyone improve student performance if they constantly have to stop teaching in order to discipline students? Effective classroom management is absolutely vital to academic success! This full day course offers strategies for classrooms, buildings and districts to cohesively reform discipline. The collective approach has been proven to save precious instructional time by drastically reducing referrals and by empowering students to change their disruptive behaviors. 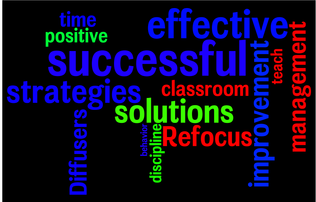 With Diffusers, Unconditional Positive Regard, and the Refocus™ Method, educators learn to increase instructional time and reduce stress in their classrooms. 1-3 graduate credits are available for this class through Brandman University. Click HERE to see the syllabus. Now that your classroom management methods have significantly improved students' time on task, how can you keep them fully immersed in the learning experience? This course is a full day of training on practical strategies that will motivate and engage your students by tapping into their intrinsic motivations and interests. Teachers come away with strategies such as Story-Telling, Synectics, Hot Seat and others, that can be instantly added to existing lessons. Learn to add some humor and excitement into your classroom! 1 – 3 graduate credits are available for this class through Brandman University. Click HERE to see the syllabus. The pricing for these seminars is structured separately from our other services. Please contact us or call: 267.342.4240 for more details and an estimate.